1978-03-28. New. Ships with Tracking Number! INTERNATIONAL WORLDWIDE Shipping available. Buy with confidence, excellent customer service! 1987-01-01. New. Ships with Tracking Number! INTERNATIONAL WORLDWIDE Shipping available. Buy with confidence, excellent customer service! Batsford, 1970-01-01. 4th. Hardcover. Used:Good. London: B. T. Batsford,, 1949.. First edition. viii, 128 pp. 95 plates, including 8 in color. Index. 4to. Near fine in slightly worn DJ. SIGNED by Tooley and dated by him, 1950. 1970-08-27. Good. Ships with Tracking Number! INTERNATIONAL WORLDWIDE Shipping available. May not contain Access Codes or Supplements. May be ex-library. Shipping & Handling by region. Buy with confidence, excellent customer service! Tooley, R. V. (Ronald Vere), 1898-1986. London, Batsford, 1949, 1949. Book. Good. Hardcover. 2nd Edition. 2nd ed ; vii, 128 pages, illustrations, charts, facsimiles (1 color), maps (including 6 color) 26 cm ; ISBN: 0713407220; 9780713407228 ; LC: G201; Dewey: 526.8/09 ; OCLC: 912606 ; faded blue cloth in color pictorial dustjacket ; [T]races the history of maps chiefly through the achievements of te great map-makes, mainly English and Dutch, but also belonging to Arabia, Italy, France, Germany and othe rcountries. Each chapter deals with the maps of a particular country and after each is a list of particular value to the collector giving the most important maps of that country and their dates. ; "a classic work on mapmaking and the ideas of major mapmakers serves as a guide for students, collectors, and general readers and illuminates the course of world history " ; Contents: Pre-Christian geography to Ptolemy -- The Arabs and medieval Europe -- Italy -- Germany, Austria and Switzerland -- Holland and Belgium -- French cartography -- English map-makers -- English marine atlases -- The county maps of England and Wales -- Large-scale county maps of England -- English county atlases -- Scotland and Ireland -- Africa -- America -- Australia -- Scandinavia ; G/VG. Bonanza, 1962. hardcover. Very Good. DJ with slight wear, small stain on cover, inside flap with small crease, bookstore sticker on flap. Batsford Ltd, 1978-03-28. 6th. Hardcover. Used:Good. Fourth edition; Cr. 4to; pp. xv, 140; frontispiece, 8 colour plates, 96 b/w. illustrations, index, original brown cloth, title lettered in gilt on spine, dustjacket with minor wear on edges, a very good copy. New York, Bonanza Books, n.d., (c-1970). London, B.T. Batsford Ltd., (1949).. First Edition; 4to; pp. viii, 128; illustrated frontispiece, profusely illustrated throughout, index; original cloth, rubbed dustjacket; spine cocked, top inside corner of dustjacket clipped; otherwise a very good copy. B. T. Batsford. Hardcover. 0713413956 New Condition. . New. Dorset Press. Hardcover. 0880291613 New Condition. . New. New York: Bonanza Books, ., 1962. 8vo. pp. xii, 140. several colour plates, many double-sided b/w plates, & some text illus. biblio. index. bds. dw. (few faint spots on spine of dw., extremities slightly rubbed with two slight tears). Fourth Impression of the Second Revised Edition.. Hardcover. 1978-03-28. Good. Ships with Tracking Number! INTERNATIONAL WORLDWIDE Shipping available. May not contain Access Codes or Supplements. May be ex-library. Shipping & Handling by region. Buy with confidence, excellent customer service! New York: Bonanza Books, 1961. 140pp. Blue cloth hardcover with gilt spine title, minor edge wear. Dustjacket worn at corners.. Second Edition, Third Impression. Hardcover. Very Good/Very Good. 4to - over 9¾" - 12" tall. N.Y.: Crown Publishers,, 1978.. First U. S. edition, from the 6th and revised London edition, with new introduction and updated lists of authorities. 140 pp. 104 plates, 7 color. Index. 4to. Fine in DJ. New York: Bonanza Books, 1961. Frontis, 140p, illustrations, indexed. 25cm. Third impression. Blue cloth; dust jacket. Jacket spine slightly darkened. A fine copy in a near fine jacket. New York: Dorset Press, 1990. Seventh Edition [stated], Second printing [stated]. Hardcover. Very good/Very good. Format is approximately 7.5 inches by 10 inches. xv, , 3-140 pages. Frontis illustration. Illustrations (some in color). Maps. Note to the sixth edition. List of Illustrations. General Works of Reference. Index. Ronald Vere Tooley (29 September 1898 - 12 October 1986) was an English map dealer, an authority on early maps and cartographers, a noted compiler of catalogues on maps, cartography and antiquarian books, author of Maps and Map-makers, and founder of the Map Collectors' Circle which published a series of monographs on historical cartography in the period 1963-1975. He is considered the founder of the antiquarian map trade. Tooley was born on Michaelmas and adopted the nickname "Mick". In 1949 his second book Maps & Map-makers was published, praised as a sound introduction and guide to a complex field, and running to many editions. Originally published in 1949, this was one of the first general works on the subject by a leading London antiquarian book and map dealer, designed to be a guide for students and collectors. "Gives full information and illustrations of the principal map-makers and map publishers and their work from the earliest times to the 19th century, combining an appreciation of the popular decorative side of early maps with historical and bibliographical notes." Illustrated with 104 black and white reproductions and color plates. NY: Crown, 1970. Fourth edition. Large 8vo, pp. xii, 140. Index. With many illustrations, a few in color. VG. New York: Bonanza, 1961. 1st. Hardcover. Very good/good. Bound in publisher's original blue synthetic leather, spine stamped in gilt. Rubbing and sunning at edges of book and dust jacket. Decorated title page and color illustrations throughout. London. : Batsford., 1949. Dj has spine very tanned; closed chips 40x19, 20x14; 22x7, 23x2 mostly on the spine; foxed. Book has occasional light foxing; top edge has been re-coloured. 128pp incl index; 48 photog plates containing 95 photos of maps, of which 8 are in col and some are diagrams in the text. Unfortunately no list.. First Edition in English.. Hard Cover Tan Cloth.. Very Good in Plastic/Good. 255x22mm. Edition: First Edition in English. London: Batsford, 1952. Second Edition. Rebound in half vellum over marbled boards, with gilt lettered spine. Boards bowed, otherwise a very good copy. . Hardcover. Very Good. Small Quarto. London: B. T. Batsford Ltd.. Very Good. (1949). Hardcover. Ex-lib; usual markings; a good copy with black and white and color plates. .
New York: Bonanza Books, 1962. xii, 140pp. 8 colour plates, 96 b/w. illustrations, index. Dj price-clipped and a little worn to the head of top edge. Book very clean and unmarked. 4th impression. hardback. Fine/V.g.. large 8vo. London: B. T. Batsford Ltd., 1952. Second Edition. Very Good/Good DJ. 8vo = over 9". Dj has some tears on edges, misg. small piece from top of spine. Foxing on endpapers & dj. Max Stein Publishing House. Wraps. Very Good to Near Fine condition. Circa 1940. Uncommon. London: Batsford, sixth edition 1978,. hbk xii, 140pp, colour plates, illustrations ISBN 0 7134 . Dorset Press, New York, 1990. Hardcover. Good. London - B.T. Batsford Ltd., 1949 Book. Very Good. Hardcover. 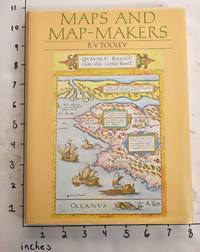 First edition.. A first edition of this study of cartography by R. V. Tooley. Illustrated throughout with numerous plates, including coloured plates. Condition: In a yellow cloth binding. Externally, generally smart, though with some marks and bumping. Internally, firmly bound. Inksignature to recto of front free-endpaper. Pagesare bright and clean. Overall: VERY GOOD..
New York: Bonanza, (1970). cloth. Fine. Quarto. Profusely illustrated A comprehensive work on maps and map making with references and an index. London, Batsford, 1970. Fourth Edition. Fine cloth copy in a near fine, very slightly edge-nicked and dust-dulled dw, now mylar-sleeved. Remains particularly and surprisingly well-preserved; tight, bright, clean and sharp-cornered. ; 140 pages; Description: xii, 140 p. , 79 plates. Illus. , charts, facsims. (1 col. ) , maps (incl. 6 col. ) 26 cm. Subjects: Cartography--History. Notes: Includes bibliographies. Impressively map illustrated throughout..
New York: Bonanza Books, n.y.. Hardcover. Small 4to. Blue cloth with gilt spine lettering, pictorial price-clipped dust jacket. xii, 140pp. Color frontispiece, numerous full-page illustrations. Near fine/near fine. A tight and nice reprint edition of the revised 1952 second edition of this 1949 classic -- undated but likely 1961. New York, NY: Bonanza Books (No Date) 140 pp. Original red cloth covers w/ gilt title on spine. Very bright and clean. DJ faintly soiled. Approx. 1" closed tear from bottom edge of rear panel. Illust. w/ numerous color and b/w plates. Contents very nice.. Hard Cover. Near Fine/Very Good+. 4to - over 9¾" - 12" tall. New York: Crown Publishers, 1982. Pp. xv, 140. With 104 illustrations in colour and black and white. Original brown cloth, gilt spine, dust jacket. A near fine copy. . Reprint. Brown Cloth. Fine/About Fine. Small Quarto. New York: Crown Publishers, Inc., 1982. 140 pp. Original brown cloth covers w/ gilt title on spine. Very bright and clean. Light foxing to edges of text block. Illust. w/ numerous color and b/w plates. Contents very nice.. Hard Cover. Very Good+/Very Good+. 4to - over 9¾" - 12" tall. Dorset Press. Hardcover. 0880291613 Like New Condition. . Fine. B. T. Batsford. Hardcover. 0713413956 Like New Condition. . Fine. Dorset Press, New York, 1990. Small 4to. hardcover. 140pp. index, b/w & colour illus. very good. / very good d/w, creased on top edge. .
New York: Dorset Press, 1987. Hardcover. Very Good in Very Good dust jacket. Sound binding and hinges. Previous owner's address label on ffep. Cloth over boards is edge rubbed. DJ has edge rubbing, light overall shelf wear. ; Information and illustrations of the principal map-makers nad map publishers and their work from the earliest times to the nineteenth century. ; 10.0" tall; 140 pages. NEW YORK: BONANZA BOOKS, 1962. VG/G, DUST JACKET PRICE CLIPPED, 140 PAGES. 2ND. Cloth. Very Good/Good. New York: Dorset Press, 1990. Hardcover. VG/VG. Clean and tight.. Cream cloth with gilt lettering on spine. Pale orange dust jacket with color illustration. xv; 140 pp. 104 BW plates, 8 color plates. "This standard work gives full information and illustrations of the principal map-makers and map publishers and their work from the earliest times to the nineteenth century, combining an appreciation of the popular decorative side of early maps with historical and bibliographical notes. This edition includes a fresh general introduction, and up-to-date lists of authorities at the ends of chapters." -- Dj flap. Condition: VG/VG. Clean and tight. New York: Crown Publishers, 1952. Hardcover. VG. Reddish cloth. xii, 140 pp. 104 color and bw plates. New York: Bonanza Books, 1961. 3d Impression. xii, 140p., colored and b/w illus., maps, lightly chipped dj, quarto format. New York: Crown Publishers, 1982. Pp. 140. Richly illustrated in colour and black & white, price-clipped cartographic dust jacket. Light pencil-ticks in the margins, else fine. One of the basic references for anyone interested in maps. . Reprint. Brown Cloth. Fine/About Fine. Small Quarto.